Children of the ’90s, say it with me: SUUUUUUUUUUUUURGE. 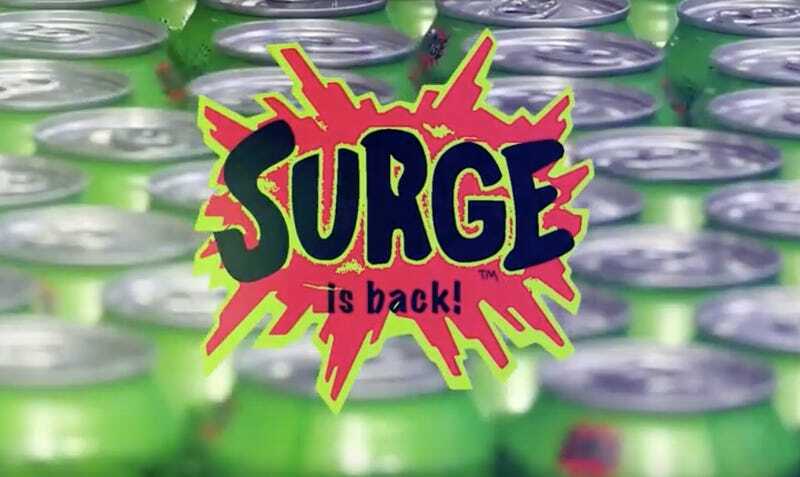 Surge, for those who haven’t had the pleasure, was a “citrus-flavored” soda from the Coca-Cola company (essentially it was the love child of Mountain Dew and Adderall.) Its brief life span lasted only from 1996 to 2003, with a reemergence on Amazon and at some regional convenience stores beginning in 2013. But Surge lovers everywhere have their chance to get amped up all over again, as Burger King announced it will bring back Surge via Coca-Cola Freestyle machines through February 2019. According to Coca-Cola, Surge “amassed a cult-like following among its young male-dominated fanbase, who loved its bright green color, bold citrus taste and quirky sense of humor.” My younger brother was the prototypical Surge fan, reaching his preteen years right at the height of its popularity. He begged my parents for its sweet, caffeinated nectar, but (sensibly), they’d only let him drink it when we were on vacation. This invariably led to what I recall as Surge binges, during which time my 11-year-old brother suddenly turned into a monstrous, sugar-fueled hybrid of the Hulk and Tony Hawk. If that sounds great to you, get to a Burger King with a Freestyle machine sometime in the next six months.